Last night I totally binged on sourdough pizza. It was glorious. But it didn’t leave me with much of an appetite this morning. Yet even when my body isn’t interested in food, my mind can’t help but obsess: what could I eat that would bring back my appetite and crank up the metabolism? 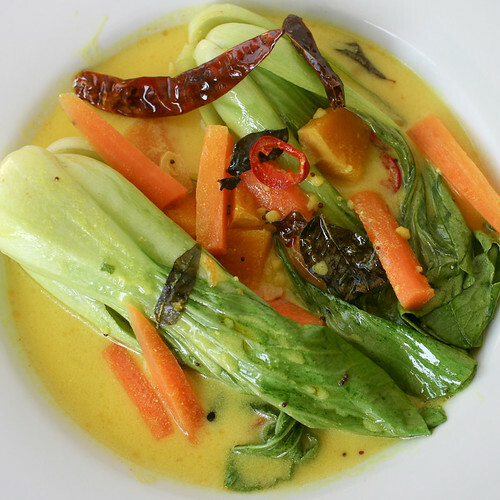 Meet kadhi: a spicy sour Indian soup made of yogurt and chickpea flour. I was first introduced to kadhi by Urvashi Roe at Sakonis in London, and again later by Toddy Peters who sent me her recipe for kadhi, which has now been sitting in my “to make” pile for weeks. Well the pile is now one recipe shorter, as I made the kadhi for breakfast and I can now say that I’m an even bigger fan of kadhi than I was before. This stuff was like instant appetite reviver. I loaded it up with veggies, including carrots, leftover butternut squash, and the unlikely pak choi (it was the only “green” I had). 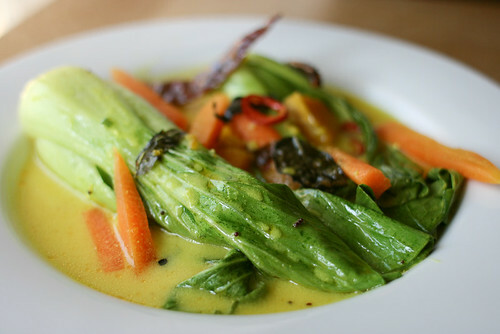 The kadhi made a great sauce for the pak choi and I will definitely be implementing this vegetable in future kadhi iterations. The tangy yogurt broth, the fresh crispy pak choi, the hot spices – this was the total solution to my digestive woes. The best yoghurt to use is not mild creamy fresh yoghurt, but the bottom of a pot that’s been open a few days, or that pot you found pushed to the back of the fridge unopened and is a few days out of date. Not Onken or anything billed as creamy and mild, more the cheapo brand in the local corner store. I opted for the posh yogurt from The Organic Farm Shop which is quite sour and also very rich. What I love about this soup is that the base is so simple, but can take on infinite variations with whatever vegetables happen to be available. Today, it was pak choi and carrots – later in the year I can see kale, parsnips and potatoes making it into the pot. As such, I’m throwing this into the mix with Ren’s Simple and In Season recipe round-up, hosted by The Botanical Baker. Hope you enjoy! This is the basic recipe for kadhi broth, to which you can add vegetables, rice, dumplings, paneer or anything you wish. I added the carrots to the broth just after adding the spices, and then the whole pak choi at the end. Make the “tarka”: heat the oil in a pan on medium heat and add the mustard seeds, dried chillies, green chilli, garlic and curry leaves. Gently fry until the mustard seeds begin to pop. Add to the yoghurt broth. Serve with additions of your choice! We used to go to Sakonis when we were kids. Can’t think why we still don’t make the trip. Time to make a return, Dhiren! That place is the bomb! Sounds – and looks – absolutely beautiful. It’s a surprising combination that really works beautiful together. I do hope you try it! Mmm, that looks like a great metabolism pick-me-up. Love all the chilis and garlic–I bet it’d be a great soup for the flu too! Carl, I’m honoured and overjoyed. Thank you! Funny how some see versatility and I see lack of focus. We are our own worst critics.